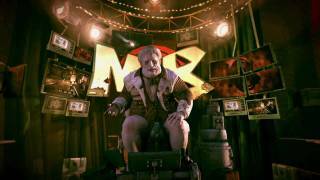 The market seems to be saturated with post-apocalyptic shooters these days, and only the prominent name of iD software was able to garner much hype surrounding the release of RAGE. 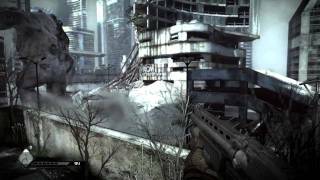 Amazingly, the legendary developers have managed to carve out their own unique nook in the world of post apocalyptic shooters, and this can only be attributed to the fractured nature of the game. RAGE almost feels like two games glued together; a fast-paced and linear corridor shooter with great atmosphere, gunplay and enemy AI, and a bloated, tedious open world racing game that plays like a pointless MMO. These two separate entities have been patched together in RAGE, and the result is an experience that has as much inconsistency as it has character. The backdrop for the brown-grey wasteland the game takes place in is that a large meteor fell to earth and destroyed everything. A select group of people were buried in underground 'arcs' in order to survive the disaster. You play as one of these survivors, and awake long after the meteor has made impact finding that the remnants of civilization have formed into a series of segregated groups, with the mysterious Encla... pardon 'Authority' holding the most power. A vague story about joining the resistance and fighting the Authority in order to free remaining arc survivors falls flat, and it is the prospect of the next firefight rather than the progression of the story that will have you wanting to continue. The first few hours of RAGE are structured similarly to Borderlands. You go to a town hub, talk to sign posts disguised as characters, receive quests, complete the quests, then return for a cash reward. The early missions are short and simple, and paint an ugly picture of the game since these tasks usually involve more driving than shooting. Driving makes up a significant portion of the open-world parts of RAGE, and you will also have the opportunity to compete in races. The car handling is extremely basic, but the addition of vehicle combat makes things slightly more interesting. Still, the driving in RAGE is more prominent than it should be, since the Races are pitifully easy and the novelty of vehicular combat wears thin quickly. After the first couple hours of the game I found myself simply ignoring the races and driving past most enemies. Once the majority of the mechanics in RAGE have been introduced, you will start on some longer, more interesting quests. Once you drive to a quest and load into a new area, RAGE becomes an entirely different game. The tone of the music changes, the lighting becomes much more dramatic, and you get to spend some time with the game's awesome combat model. You are given a good variety of weapons to kill with, ranging from the standard shotguns and assault rifles to more interesting weapons like the cross bow. The weapons themselves aren't terribly exciting, but you are given several ammo types for most guns that are useful in different situations. The cross-bow, for instance, has electrified bolts which electrocute enemies, and dynamite bolts that explode after being stuck into foes. All of the weapons feel powerful and have a good kick to them, but it is the enemy AI that really makes the combat enjoyable. The same thing occured to me, if they had taken the resources that went into developiong town hubs and vehicle combat into fleshing out the linear levels and improving the story, RAGE could have been a lot better. I didn't like it much, disappointing even after I got it running well.If they just made a linear fps with the combat Rage had, I probably would have liked it more. Rage is ranked #1033 out of 1434 total reviewed games. It is ranked #104 out of 112 games reviewed in 2011.